The 2016 Volvo S60 lineup expands this year with the addition of two new models. The S60 Cross Country adds ride height and off-road capability to the midsize-luxury sedan, while the 2016 S60 Inscription adds something even more valuable: rear legroom. 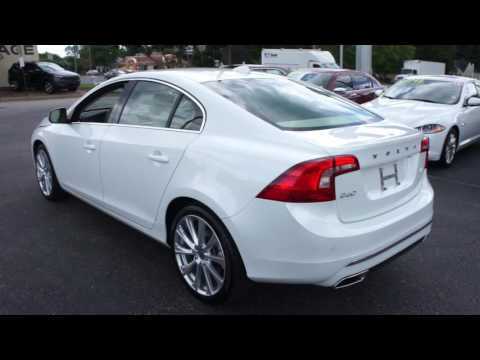 With its fuel-efficient 4-cylinder engines and excellent safety systems, the off-the-beaten-path Volvo S60 is a strong choice. Great riding and driving car. I love my Volvo (it is my 3rd) for many different reasons. Most important is that I feel very safe in it. I was t-boned by an old man in an old SUV when the car was 2 weeks old and the police and firemen told me that if I would have been in any other car, I would not have walked out. It is extremely comfortable and it has a solid ride. All the controls are easy to see and use. My problem is that on the highway, I get carried away and because the ride is so smooth, I have to remember to look at the speedometer. Getting a new one when they come into the showroom lastly, and most important is that their service department is fantastic. I LOVE my car! Not only is it super reliable, but she's a beauty - sleek without making me look like a douche OR a soccer mom. It's fast as hell and feels very solid on the road, with lots of great features. It has a sunroof and seated heats, beautiful wheels, and GREAT gas mileage (especially now that I'm driving more reasonably). I wish I saw fewer of them on the road, but they are wonderful cars. My vehicle is a push to start vehicle. My vehicle is a very good vehicle. I have the Volvo s60 and I have had it for 2 years now and it is in great condition. It has a smooth ride and one of the features I like best on it is it alerts you when you are too close to a vehicle or a vehicle is too close to you. One other thing I like about it is it is nearly impossible to lock yourself out of the car.